Concrete is the most-used manufactured material in the world, with nearly three tons per person used annually. Its benefits to society are immense, as it is used to build schools, hospitals, apartment blocks, infrastructure, and more. Specifying either a new or renovated flooring system for a commercial building often comes down to the quoted cost of the materials and labor needed to complete the job. Modern technology has made its mark on stone design as well as fabrication. Today, project teams taking advantage of technology are experiencing increased freedom in control of the design concept, from development through to fabrication. The Carnegie Center Campus in Princeton University, New Jersey, used fabricated glass that helped earn the Leadership in Energy and Environmental Design (LEED) Platinum certification. An ultra-green office building was created in Princeton University, New Jersey, using high-performance materials and cutting-edge technology. The facility was awarded the Leadership in Energy and Environmental Design (LEED) Platinum certification. More than 4274 m2 (46,000 sf) of fabricated glass was used for the facility. 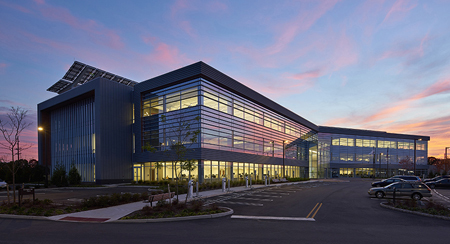 Jacobs Engineering Group designed the three-story, 12,077-m2 (130,000-sf) building. Insulating glass units (IGUs) were used in multiple configurations, featuring high-performance, low-emissivity (low-e) coated glass on the walls and entrances. The IGUs also incorporated the warm-edge spacer system, minimizing the units’ primary seal migration to provide straight sightlines, as well as maximizing their structural stability and thermal efficiency. The contractors used 836 m2 (9000 sf) of glass systems for the building’s interior, including precision-fabricated laminated clear glass partitions and doors. The building also features 929 m2 (10,000 sf) of solar panels, rainwater and daylight harvesting systems, a green roof, two wind turbines, and more than 30 electric vehicle charging stations.